Folded leaflets and flyers mean you can include more promotional information, bigger images and more appealing artwork. Improve your leaflets and flyers by choosing our folded leaflet and flyer printing service: decide on paper thickness, finishing and size in a few simple clicks and you could be looking at your new leaflets or flyers within 5 working days! Try folded design on prices that won’t break the bank - no hidden charges, so you save even more. 1. Please choose from the options below to customise your order. 2. Please choose from the prices below to order. 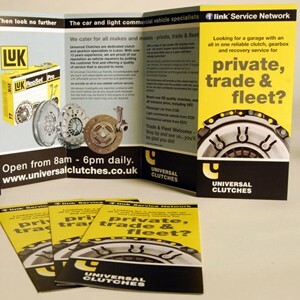 We offer a wide variety of choices when it comes to your folded leaflet and flyer printing. All folded leaflets come in either a gloss or silk finish to ensure we provide you with the highest quality. Our paper ranges in thickness from 130gsm to 350gsm. We recommend 130gsm for standard folded leaflet printing or 170gsm for a higher quality finish to give it that cutting edge look. Our 250gsm and 350gsm folded flyers are thicker and are available either in a gloss or silk finish. We can print your folded leaflets and flyers on A4, A5, A6 and DL size gloss or silk paper. Our low price does not mean low quality printing! Our full colour leaflets and flyers are provided to you in high quality 130gsm, 170gsm, 250gsm and 350gsm paper. We also offer leaflets and flyers. On approval of artwork your order will be dispatched within 3-5 days. Check our Artwork Guidelines before sending us your artwork. Eprint 247 Limited, 18-26 Latimer Road, Luton, LU1 3UZ.© Eprint247. All Rights Reserved.